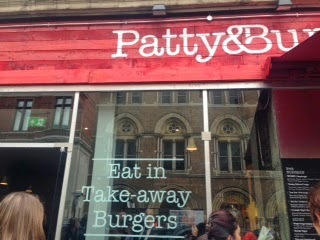 I'd heard that Patty& Bun made excellent burgers so when one opened a stone's throw from my office it wasn't long before I went; I treated myself to a takeaway burger on my birthday. It is a very small restaurant seating around 20 so the takeaway is ideal for a busy lunchtime; you order at the counter inside then wait at a window outside to collect your food. That was a little confusing so I was glad someone in the queue explained it to be when I arrived. There isn't a huge menu but it has everything you need - burger, cheeseburger, chilli burger, vege mushroom burger, chicken wings and a few sides. I had the "Ari Gold" cheeseburger (£7.50, plus £2.50 for the fries), and asked why it was called that - knowing that Ari Gold is a character in the TV show Entourage. The server told me that it was because Ari Gold was "awesome and really cool, and Jeremy Piven who plays him has come into the restaurant". By the time I got back to my office - about five minutes - the burger juices had soaked through the paper and I understood why there was a cardboard tray in my paper takeaway bag, otherwise my desk would have been a bit of a mess! 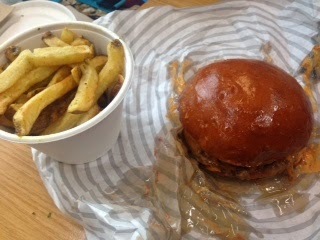 This was an incredibly juicy burger, cooked medium rare (I was asked my preference); the "pickled onions" on the menu which intrigued me were sliced red onions (rather than the pickled kind you get in jars), the cheese had melted to perfection and the slight sweetness of the brioche bun offset the burger. I devoured this and really enjoyed it. The rosemary salted fries were good though I had a few more small and crispy bits at the bottom than I would have liked. Service was very fast - there was a queue of maybe half a dozen people waiting to order and about ten waiting to collect food but I only waited about five minutes to order and hardly more than five minutes to collect the food. And it was definitely worthwhile - an excellent burger.